Julia Schramm, a prominent board member of the German Pirate Party, had success in scoring a lucrative book deal and finally had her work published this week. Nothing out of the ordinary there, if it wasn't for the fact that Schramm and her publisher are now clamping down on book pirates. 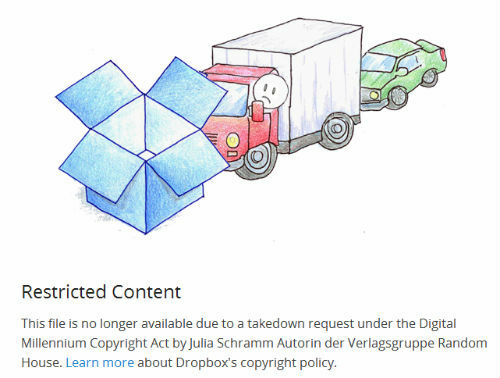 Dropbox removed a copy of Schramm's book after it received a DMCA take-down request today and another copy hosted on the Pirate Party's own site also vanished into thin air. 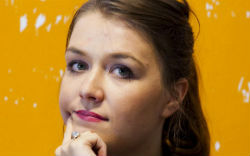 Julia Schramm is a well-known German blogger and prominent member of the local Pirate party. At least… she used to. Yesterday, when Schramm’s book “Click Me: Confessions of an Internet exhibitionist” was released both on paper and as an e-book, the tide started to turn. To help her publish the book Schramm signed a major deal with the Random House owned publisher Albrecht Knaus Verlag. In addition to earning a 100,000 euro advance, this deal with the “content mafia” required her to sign away her copyrights. This means that Schramm, nor any other person, is able to share a copy of the book. This is quite obviously an awkward position for a board member of the German Pirate Party. A copy hosted on the Pirate Party’s wiki disappeared as well. Responding to the controversy, the Pirate Party politician defends her move with the argument that people can still read her work elsewhere. “There will always be free texts from me on my blog, and there are also book excerpts,” she told Welt, adding that she will make her book available for free in 10 years when she gets her copyrights back. While we’re not condemning people’s right to sign copyrights away to publishers, it is certainly not something you would expect from a Pirate Party politician. While writing a book is free and doesn’t require the exploitation of copyright (see other Pirates), being in the spotlight and making good money often requires sacrifices. When that’s the case, it appears that certain ideals and aspirations are easier to throw overboard than others.